Wetherspoon operates five pubs here – four in Dublin and one in Cork. AN BORD PLEANÁLA has given the green light for a ‘super-pub’ in the Camden Street area of Dublin to pub giant, JD Wetherspoon plc. The appeals board has granted planning permission for the €4m development at Camden Hall that also includes a 98 bedroom hotel in spite of local concerns that the pub would be part of a continuing trend “to completely alcoholise Camden Street”. The board ruling represents a comprehensive planning victory for JD Wetherspoon as the ruling omits a planning condition imposed by Dublin City Council seeking to curtail the size of the pub. The City Council ruled that a 244 sq metre ‘dining area’ and courtyard with tables and chairs be omitted from the plan. However, this has been overturned on appeal. Already, Wetherspoon operates five pubs here – four in Dublin and one in Cork. A spokesman for the UK based Wetherspoon described the ruling as ‘great news’ stating that the project will lead to the creation of 200 jobs. He said that the firm hopes to commence work on the project “sooner rather than later”. Local man and appellant, Barry Chambers told An Bord Pleanála that allowing another pub in the area, “not to mention the large scale drinking established being proposed would be seriously detrimental to the residential amenity and character of the area”. Chambers was one of a number of local residents to oppose the plan. In his appeal, Chambers argued that “drink fuelled ever increasing noise, nuisance and anti-social behaviour, ranging from the benign to the very serious which goes hand in hand with the drinking culture has already, regrettably, started to change the character of the area for the worse”. The introduction of a super pub selling cheap alcohol into the melting pot does not bear thinking. Chambers pointed out that the area is densely populated with young families and “it is sincerely hoped that we do not go further down the Temple Bar route – an area that has been blighted by the over concentration of pubs and late night drinking”. In a rebuttal to Chambers’ appeal, Wetherspoons said that to imply that the proposal includes a super-pub “is disingenuous, misleading and clearly not the case”. 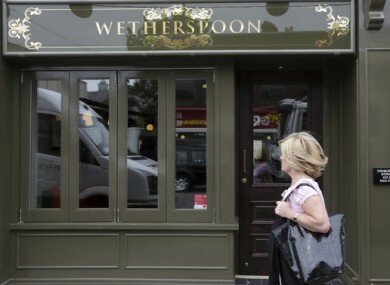 Wetherspoon stated that the proposal “is not intended as a late- night destination with the latest expected opening hours to be at 12.30am at the weekends. The venue will be focused on the service of food with a complementary drinks service and will play no amplified music”. The pub firm stated that there is not an over-concentration of pubs in the area. restaurant/bar/courtyard gardens with tables and chairs is a considerable quantum of development in this area. The board gave the plan the go-ahead after ruling that it would not adversely affect the character or architectural significance of the historic buildings on site, would not seriously injure the amenities of properties in the vicinity and would be acceptable in terms of traffic safety and convenience. Email “Wetherspoon's gets green light for €4 million 'super pub' on Camden Street ”. Feedback on “Wetherspoon's gets green light for €4 million 'super pub' on Camden Street ”.